I know, I know, more shortbread. I think I’ve mentioned this before but (besides my mom’s famous chocolate chip cookies) I’m not often tempted by cookies in general, especially not if there’s cake around. But shortbread…buttery, crumbly shortbread…it gets me every time. 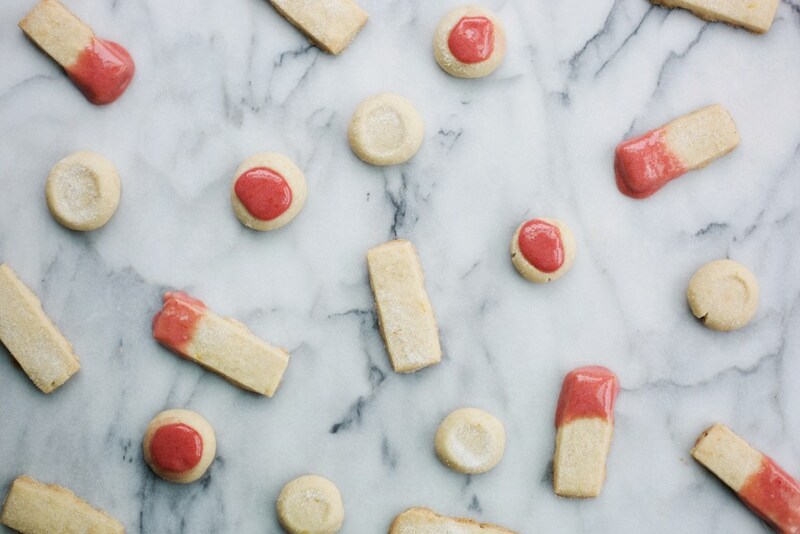 Please feel free to substitute your favorite thumbprint cookie recipe in its place, but Bouchon’s shortbread recipe works beautifully here. If you are looking for something to do with the leftover curd you could use it in place of the grapefruit curd in this cake. I also made some changes to my usual shortbread recipe, adding some lemon extract, zest and a little vanilla salt. 1. Bring about an inch of water in a large saucepan to boil, then reduce to low and simmer. Strain the citrus juices, then combine the juice, eggs, egg yolks, star anise and sugar in a large metal bowl that fits snugly into your saucepan. The bottom of the bowl should be above the water, not in it to prevent cooking the eggs. 2. Gently whisk until mixture reaches 170 degrees or until it has thickened and coats the back of a spoon. Remove from heat. 3. 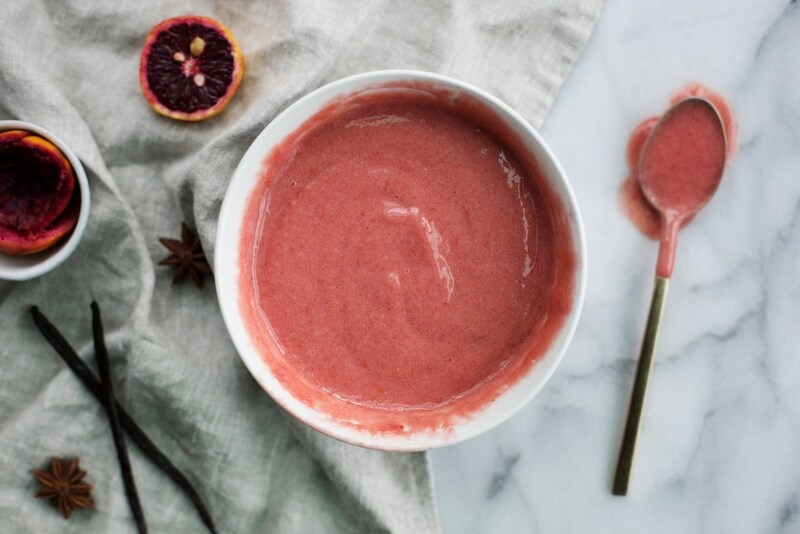 Stir in butter pieces until combined, strain with a fine-mesh strainer placed over a bowl, and stir in blood orange orange zest. 4. Will keep in the fridge for up to 5 days or frozen for 3 months. 1. Place the butter and zest in the bowl of a stand mixer fitted with the paddle attachment. Cream on medium-low speed until smooth, about 3 minutes. 2. Add the sugar and salt and mix on medium-low speed for about 2 minutes or until fluffy. Scrape down the sides and bottom of the bowl. 3. Add the vanilla bean paste and lemon extract and mix on low speed for about 30 seconds to distribute evenly. Add the flour in 2 additions, mixing on low speed for 15 to 30 seconds after each, or until just combined. Scrape the bottom of the bowl to incorporate any flour that may have settled there. 5. Position the oven racks in the upper and lower thirds of the oven and preheat the oven to 325 degrees, using the convection setting if you have it. Line 2 sheet pans with Silpats or parchment paper. 6. For rectangular cookies, unwrap the dough and place it between two pieces of parchment paper or plastic wrap. With a rolling pin, pound the top of the dough working from left to right to begin to flatten it, then turn the dough 90 degrees and repeat. (This will help prevent the dough from cracking as it is rolled.) Roll out to a 9 in square. If the dough has softened, slide it (in the plastic wrap or parchment) onto the back of a sheet pan and refrigerate it until firm. Cut into 2.5 in x ½ in rectangles.Combining the leftover dough, rolling out, and repeating until you've used it all. 7. 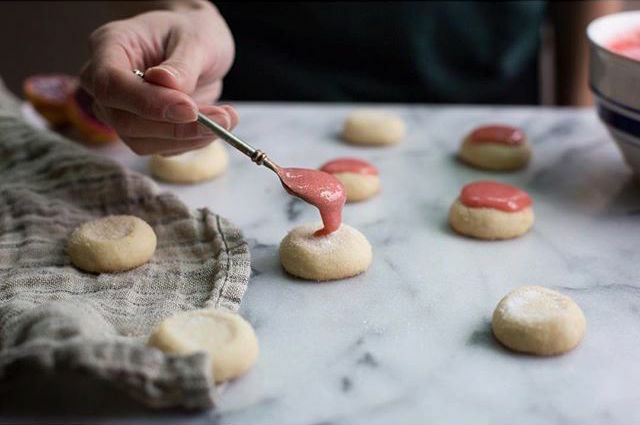 For thumbprint cookies, roll 1 inch balls of dough, then place on the cookie sheet and press down with your thumb to create an indention. 8. Dust the tops of the shortbread with coarse sugar and arrange on the prepared sheet pans, leaving about ¾-inch between them. 9. Bake until pale golden brown, 13 to 15 minutes in a convection oven, 17 to 19 minutes in a standard oven, reversing the positions of the pans halfway through baking. 10. Set the pans on a cooling rack and cool 5 to 10 minutes. Transfer the cookies to a rack to cool completely. The shortbread can be stored in a covered container for up to 3 days. 11. 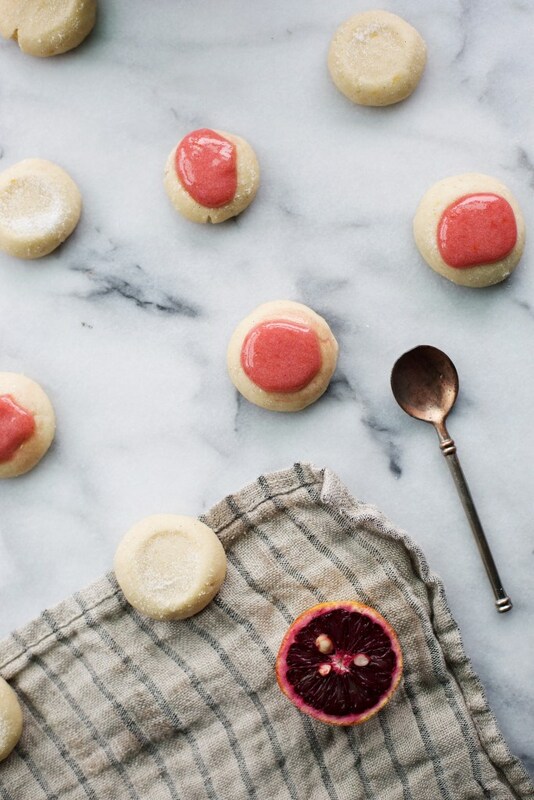 Once the cookies have cooled completely, dip them in the blood orange curd or spoon it liberally over the cookies, allowing it to drip over the sides.